It's time again for Secret Recipe Club reveal! My secret blog assignment this month is Adventures in All Things Food. Andrea lives on a large fruit and vegetable farm in Oregon with her husband and their three adorable kids, She and the kids grow some beautiful produce in their backyard garden, and she loves good food without a lot of fuss. Because, obviously she is extremely busy, but still wants to feed her family well. Zucchini and Quinoa Salad - not the right time of year, but I will definitely have to try this when summer rolls around, and I start getting zucchini from the garden. 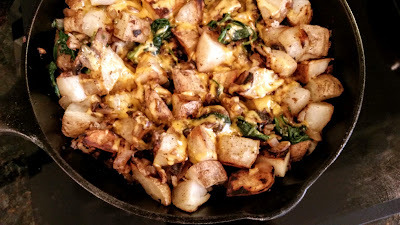 When I saw these skillet potatoes, I knew I had to try them. There is just something about the combination of mushrooms and spinach that I am a bit addicted to, and these just looked so good. The only thing I changed about this recipe was to add an onion, because everything needs an onion! But really, I think these potatoes would be wonderful with or without the onion. Heat cast iron skillet over medium-high heat. Drizzle some olive oil into skillet and saute onions and mushrooms until tender and starting to brown. Add spinach and allow to wilt. Remove from skillet and set aside. Drizzle a little more olive oil in skillet and add cold cubed potatoes to skillet. Allow potatoes to brown on the bottom and then add the butter. When butter starts to melt, turn potatoes and allow them to crisp up on the other side. Once they are nice and golden, stir the mushroom mixture back in. Add salt and pepper to taste. Turn the heat off; sprinkle cheddar on top, and cover with a lid until the cheese melts. Serve immediately. 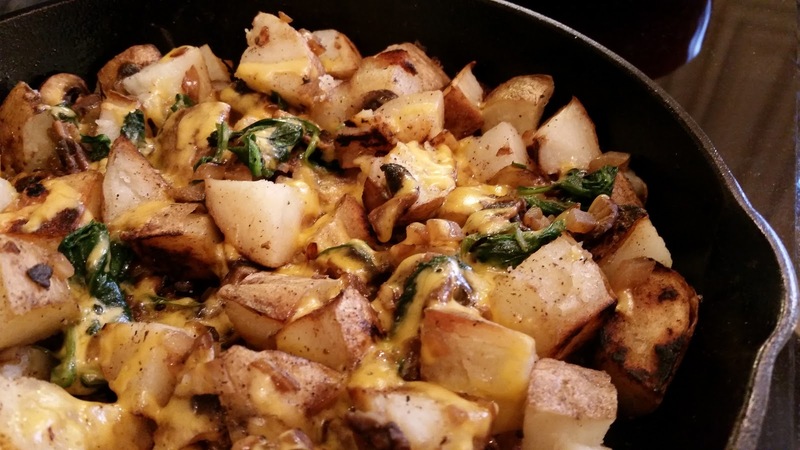 I've often relied on fried potatoes as an easy dinner when I don't know what else to fix. Heat some oil in a pan and toss in some potatoes, onions, and sometimes peppers, and you've got a yummy and satisfying meal. These particular potatoes don't quite work that way. Oh, they're definitely yummy and satisfying, and they are awesome for dinner. But they do take a little planning ahead because the potatoes need to be cooked ahead and refrigerated, so when they go into the skillet all they really need to do is warm and brown instead of cook completely. That extra step is most definitely worth it. The flavor is wonderful. And when I added the butter to the skillet? Over the top, heavenly smells in my kitchen! These potatoes were just wonderful. Even after I was stuffed from eating so much, I just could not stop picking individual pieces of potato out of the skillet and eating them. So good. And then the leftovers? Just as good. I heated them up and then scrambled some eggs with them, and added some additional cheese to the top. They were perfect! I will definitely be making these again.